Its use of creepy atmosphere and general paranoia are some of TV’s best and there’s really nothing today that can call itself this generation’s X-Files. (Okay, maybe Supernatural, but let’s be honest: Supernatural stopped trying to be even semi-watchable after the seventh season.) Since there’s no “FBI hunts down monsters/ghosts/aliens/bigfoots” show for the audience of the modern day, it only makes sense for Fox to reboot The X-Files for a whole new generation to enjoy. 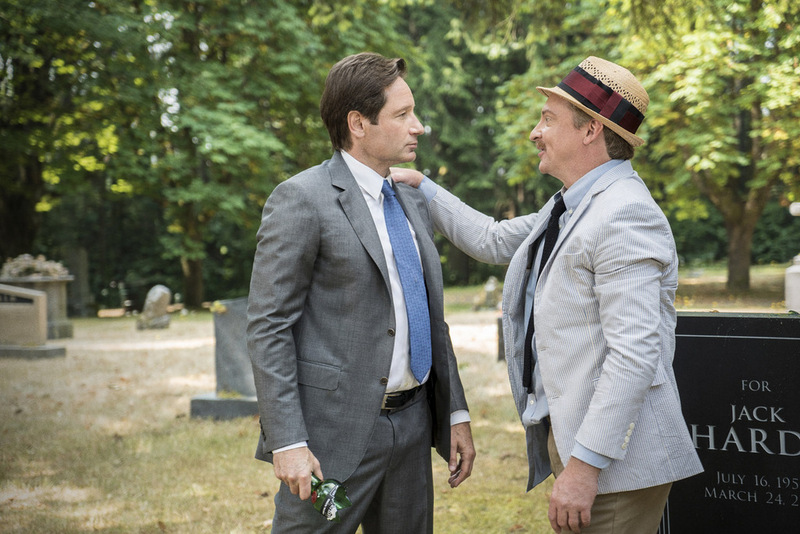 So before we go any further, I’d like to fully disclose that I have only seen the most recent episode (episode three) of the new X-Files, thus everything I say must be taken with a grain of salt. However it should also be mentioned that The X-Files runs on a monster-of-the-week schedule and thus both previous episodes bear little importance to the third… take this as you will. So the first thing I noticed when viewing The X-Files is that everything I just mentioned about its atmosphere and pacing is completely thrown out the window. Once creepy and mysterious monsters are replaced by immediate monster reveals and goofy-looking costumes. Once important themes that played a big part in the original series, such as perversion or mental illness, have been downgraded to mere comedy sideshows that are unfunny and come off as offensive. For example: this episode’s goofy monster is lurking around a truck stop and attacks a transgender prostitute. Mulder and Scully then interview her after the attack and that soon segues into a “wacky” talk with a transgender prostitute that may or may not be high on cocaine. Ha-ha-ha-ha, oppressed minorities are so funny? There’s also spray paint inhalers, a Russian psychologist, and a perverse innkeeper. All of them are handled about as well as a raging gorilla handles fine china. You know, maybe the latter episodes of Supernatural and The X-Files reboot have more in common than previously thought. In fact, I wouldn’t blame you if did confuse this with a bad episode of Supernatural, since it plays out like just like one. Though at least Supernatural’s acting hasn’t gone downhill. While Gillian Anderson (Scully) can still put on a good performance, David Duchovny (Mulder) is a different story. He’s just tired and wooden at best and couldn’t act his way out of a blanket at worst. It doesn’t help that most of his dialogue is depressing “my life is a lie” schtick (this coming from the character that always believed in the supernatural element, no matter how blatantly wrong it seemed he was). The only thing that saves this from being a complete trainwreck (besides Gillian Anderson) is the twist at the end of the episode. I won’t give it away, but it’s actually rather well executed and funny (but then they follow it up with another plot twist that ruins any good will the first one garnered). Ultimately, if the third episode is anything to go by, The X-Files is sloppy. Brilliant atmosphere, creatures and writing have been replaced by a lazy plot and jokes so bad that “Yo Mama” called to tell them that she wanted her stereotypes back by 9:30 on the dot. However, despite all of that negativity, I still encourage you to watch it if only to see if it gets better (keep in mind that they still have three more episodes to get it together). As I said in the disclaimer, I only watched episode three and it could just be a narrative and acting and scriptwriting dud.